Use TomatoUSB as bridge to a seperate gateway. Forum » Discussions / General » Use TomatoUSB as bridge to a seperate gateway. 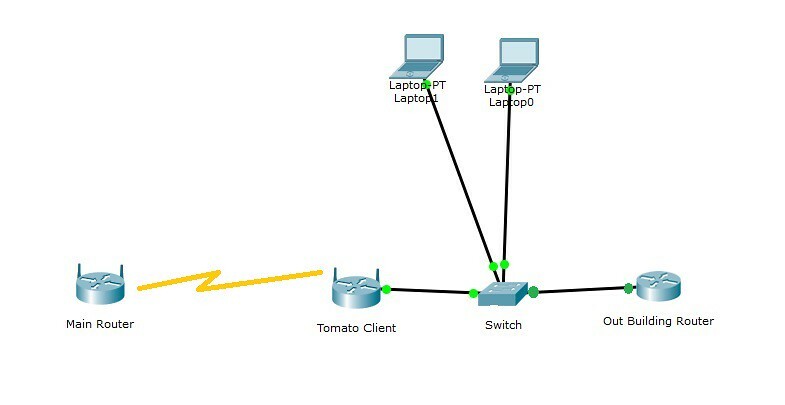 TomatoUSB is for internet, have other router for main router on network. I'm new to TomatoUSB and trying to set up my Linksys E4200 as just the access point for internet. I have the client part setup fine and access to internet via the Tomato. I have it set up as a wireless client to access the internet from my main building. I then have a different router in my out building that runs the rest of my little network. Everything is set up for static, no DHCP on my small network. All my computers are pointed to my main router, 192.168.3.251. My main router/switch are connected to my computers, so I'm trying to get my main router to share access to the internet via the Tomato wireless client. Do I need to some how tell the tomato router that the main router is the gateway point? If so, where do I do that? Hopefully this isn't too confusing, my brain is semi scattered at the moment. Re: Use TomatoUSB as bridge to a seperate gateway. I figured out how to make it work, so far. I just made two different subnets and set my gateway to the Tomato Client. Then set multiple subnet routing in my old router in the out building. Able to access internet and still access the different subnets I have currently.